To surely know what food allergies that cause itchy skin on yourself, you either have to do a blood test or experiencing one first. Most people don’t know they’re allergic to certain food until they eat it. The trick to live with food allergies is to avoid eating them. The symptoms like itchy skin, hives, nausea, dizziness, breathing problem or even anaphylaxis occur, can be one of them at a time, or worse, all of them in the same time. 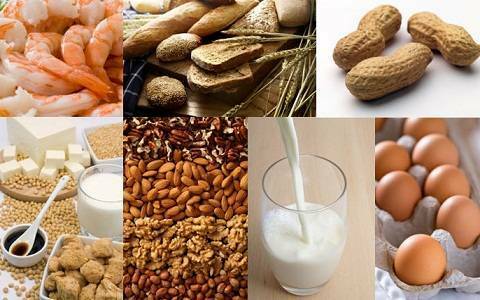 Some food triggers all of them, here are 6 of common food allergies that cause itchy skin. Eggs are practically everywhere. It’s the most basic ingredients and it’s also healthy, full of protein. Usually the allergen is the white egg, not the yolk. But to be safer, avoid eating either of both. You should also avoid eating egg powder, dried egg, and egg solids. Also avoid any processed food with egg as the ingredients, baked food, cream pie, mayonnaise, pastas and many other food contain eggs. You should look carefully to ingredients like albumin, globulin, lecithin, lysozyme, ovalbumin and ovovitellin, because they’re the names of egg protein. Yes, milk is one of the food allergies that cause itchy skin. But it’s different from lactose intolerant. Lactose intolerance is when you can’t digest lactose, the sugar found in dairy products. It will only cause you stomach pain, gas and diarrhea. 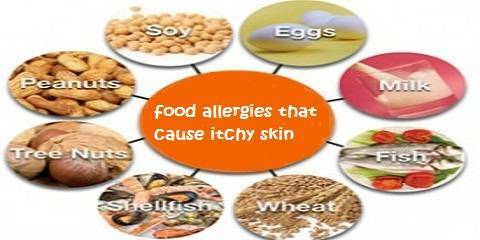 While milk allergy, it cause you those allergies symptoms. Same like egg allergy, you should also avoid processed food with milk as the ingredient. You can substitute your diary need with soy, rice, or almond milk fortified with calcium. The nut you should avoid is not only peanuts, but also the tree nuts. You should be careful if you have this allergy because a tiny amount of ingested or even inhaled nuts could cause allergic reaction. If you originally allergic with peanuts, try to avoid tree nuts, and otherwise. Because nuts allergy is very sensitive, it’s suggested that you carry epinephrine auto-injector with you all times. If you know that you’re allergic to one kind of fish, it’s best to avoid other fish or other seafood. Although they’re different, they might cause you the same allergic reaction. Be careful of fish processed food like worcestershire sauce, Caesar salad and dressing, caponata, caviar and fish role. In short, stay out of seafood restaurants. If you’re allergic to wheat and you eat one, you will likely to have itchy skin because it’s one of the food allergies that can cause itchy skin. Avoid eating bran, bread crumbs, bulgur, durum, and many other foods with wheat protein. You should ask your doctor about other grains you might don’t know before. Avoiding soy is as hard as avoiding egg and milk because it’s also a big part of processed foods. Always read labels carefully, and if you find glycine max, hydrolyzed vegetable protein (HVP), mono-diglyceride, monosodium glutamate (MSG), don’t eat it because those are the other name of soy.